The village of Lovčica – Trubín is partly located in the north-western part of the Žiar Kettle (Žiarska kotlina) in the valley of Trubínsky potok (Stream of Trubin). Deforested uplands in the kettle are composed of Tertiary deposits with remains of gravels from the Quarternaly period. The forested areas of the Vtáčnik Mountain consist of rhyolites and a rhyodacites. The forest crop is represented by fir and beech. Prevailing is forest soil. Altitude in this part of the village reaches up to 330m whereas it ranges between 270m - 833 m within the district. Lovčica: 18th cen. chapel built in late Baroque style. Trubín: 15th cen. Roman-catholic church built in Gothic style, first reconstructed in 1573 and 1669 and later in the 19th century. Memorial dedicated to the seventeen guerrila and soldier victims killed during the WWI. Among the most valued civic coats of arms there are speaking coats. a golden cross-bow with silver bow-string and a silver arrow placed above a silver-plated bugle, all depicted on a shield background. 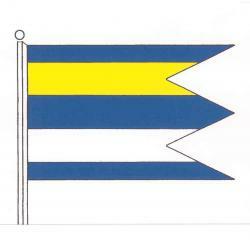 The village flag consists of five vertical stripes of blue (1/8), yellow (2/8), blue (2/8), white (2/8) and blue (1/8) with its aspect ratio of 2:3. The flag is ended up by three lappets stretching down to its third. of LOVČICA-TRUBÍN; its diameter as wide as 35 mm. The village is situated in the northern and north-western part of the Žiar Kettle. Its district covers eastern parts of the Vtacnik Mountain. The altitude is 335m in the centre of village and it ranges between 265m - 874m above see level in the district. In the district part named Sitienec there are prehistoric barrows dating back to Lusatian culture of the late Bronze Age around 700 BC. Another prehistoric settlement testimony can be found in Sitieň next to Delenická studnička where relics relating to the migration of nations had been found. More relics speaking of settlement occur to be buried near Hrádok, with its origin dating back to the Slavic period. The first written record dates back to 1487 when the name Trwbyn appears in accounting documents of the Ostrihom archbishop Hypolit de Este. In later documents, the village is called Turbus. Its ancient origin can be proved by ruins of a Middle Age fortress. Another eloquent source documenting its rich history is the local church built between 1253 and 1260; records from 1487 describe the it as „old“; statement supported by the fact the church was built in Gothic style. The whole 16th century is characterized by fear of Turkish raids. On September 17th, 1647 a citizen of Trubin, Ondrej Rosenauer, addresses to the mayor of Kremnica a letter describing the raging of Turks near the river of Hron. The following centuries did not bring along much peace, either. After the threat of Turkish raiding had gone, people were faced with Bockai´s War of Independence followed by plague in 1679. The 19th century saw a number of historic events that had a deep impact on the lives of local inhabitants. In 1820 half of the village was burnt down in great fire that re-appeared in 1861, 1870 and 1875. In 1845 the village suffered from bad crops caused by heavy rains. Later, in 1848-1849 the village became battle ground. At that time there was an observation point established on top of the church tower and the district experience the arrival of artillery troops. In 1859 a new clergy man, Ján Szepessy de Négyes , coming from Kremnica, took his office. Born into a a squire family, in spite of his German background he grew up to be a keen nationalist and revivalist. It was with his permission that local children at school were educated in Slovak. Both personally and hierarchically, Szepessy was closely connected to the archbishop of Banská Bystrica, Štefan Moyzes, co-founder and the first president of the Matica Slovenská. He was a frequent visitor to the parish house, often accompanied by other Slovak nationalists and members of Slovak intelligence, mostly the Sturs or their younger followers. Let us mention František Sasinek, Daniel Lichard, Martin Hattalla, Karol Kuzmány, Ondrej Radlinský. The parish house witnessed preparations of resolutions and programmes to support and codify the Slovak language as well as the fight against Hungarian oppression. The beginning of the 20th century is characterized by rise of strong national feelings. One of the most important representatives of the period, Milan Hodža, was also often to be seen in Trubín. Peoples´ quiet lives were struck by the World War I. A list of war victims can be found on a memorial desk in a church aisle. In 1919 the Spanish flue epidemic killed nine locals. In Jun 1919, a mayor and a council of eleven members were elected at the first ČSR elections. In 1923 the Hlinka´s Slovak Popular Party won the elections and a new mayor along with five council members were appointed. On July 1st, 1926, a day to remember, the local post office was establish, followed by a public phone station located at the parish house that was put into service in September 1937 to connect the village with the outside world. During the World War II village witnessed a number of changes and dramatic events. Trubín was finally liberated on April 4th, 1945. In 1950 a minority project of agricultural cooperation started off; seven year later it gave rise to the agricultural cooperative ( JRD). The village of Lovčica is situated in the east-western part of Žiar Kettley, in the valey of Trubínsky potok. The average altitude in the village centre reaches up to 330 m above see level, whereas the altitude of the remaining village area ranges between 270 m – 833 m above see level. The first written record dates back to 1487 speaking of a village called Kisslloka and its five service yards. In the 14th century under rule of Matúš Čák Trenčiansky the village and its surrounding areas saw ruthless fighting of his army when retreating to Handlová. Only a century later armies of Ján Jiskra of Brandýs and Ján Hunyady raid the region. In 1571 - 1573 the name of the first mayor is recorded. In the 16th century Turkish hords rob the country aiming to take over Kremnica. Failing in their efforts, they take revenge on the city´s neighbourhood. There are no known data referring to the village until 1679, though it is possible they do exist but are difficult to discover. Records from 1679 speak of plague that spread over the village killing 281 people. Lives of local inhabitants were occasionally disturbed by natural disasters, mostly conflagration. In 1820 fire burnt down half of the family houses and some farm buildings in the village. The fire repeated in 1861, 1870 and 1875, leaving nearly all of the villagers both homeless and fortuneless. As the 20th century wore away peacefully, in 1912 a construction of a new school building was set up to be finished the following year as the first school building in the history of village. Their lives were disturbed by the outbreak of the World War I. All fighting-fit would-be soldiers were recruited as early as in the summer of 1914. Among those who joined the army 2O were killed at the battle field. By the end of 1918 a Spanish flue epidemic took over the place, leaving another four people dead. After the WWI had been over, the locals welcomed the new state establishment and at the beginning of 1919 the village was re-named as Lovcica. In the same year a new council election took place to appoint 13 newly-elected council members and a new mayor. The following elections on 16th September 1923 established a mayor and five council members. In the period of high unemployment up to 26 families moved out to Lowlands , France, Germany and America. People´s orderly lives were once again invaded by World War. During the WWII around 19 Slovak, 4 Russian, 1 Romanian and 8 German soldiers and 22 civilians were killed. The front had destroyed or damaged about 44 houses and farm buildings. Among the most important historic events of the post-war period there was a bus approach enabling the villagers to use a regular bus connection. In June 1947 a two-way bus route between Sv.Kríž nad Hronom – Lovčica Chapel – Handlová – Prievidza was put into service. In March 1947 the village was wired up through a telephone connection. In 1957 a single cultural co-operative was founded to administrate the entire farm land. According to the Council resolution No. 141/1971 – R ONV from July 9th 1971 taken in Žiar nad Hronom the village of Trubín and the village of Lovčica were merged together to form a corporate unit under the name of „Lovčica-Trubín“.